I have just lived a dream. Five years ago I learned of a school where students of all ages could study Spanish intensively while living among the Guatemalan Mayans. Peace Accords had been signed in 1996, the government was encouraging tourism, and it was, finally, safe to visit. Why a dream? Because, 25 years ago, when I traveled through Central and South America, I promised my family I would avoid Guatemala because of the perceived was dangers. During that trip, as I met my Europeans and other who had visited, remained safe, and found it a fascinating country, I vowed to visit someday. Originally published by The Standard Times on March 3, 2007. Irene Scharf, Living among Guatemalan Mayans is fascinating experience, The Standard Times, Mar. 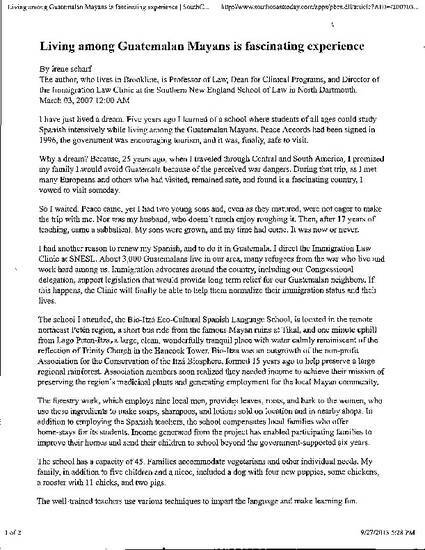 3, 2007, http://www.southcoasttoday.com/apps/pbcs.dll/article?AID=/20070303/OPINION/703030310&cid=sitesearch.